‘Majuli’ biggest reverie island of the world is also located in the north of the district. Jorhat as the last capital of the Ahom Empire is also rich in its cultural heritage. The Festivals in Jorhat are celebrated with much joy and grandeur. The Tea Festival is celebrated in the district of Jorhat every year with great fun, enjoyment, and entertainment. This festival is all about tea, gaiety, and music. The Tea festival in Jorhat brings to you an excellent package of excitement and fun. The Jorhat tea Festival generates a mood of festivity with traditional and a warm cordial reception. The Tea festival in Jorhat is celebrated by visiting the tea gardens, tasting delicious food items, safaris into the jungles, playing golf and last but not the least by shopping and cultural entertainment. Adventure sports like rafting and angling in turbulent rivers are also held during the festival. Jorhat Tea Festival is a blend of a pleasure trip and business trip. 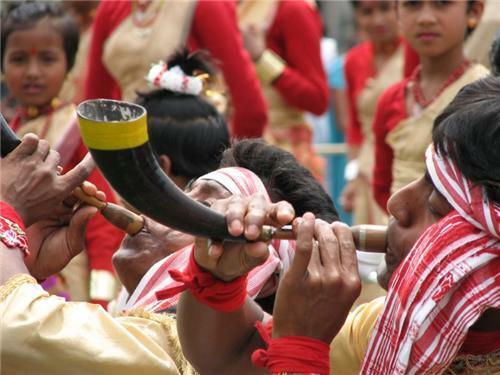 The tourists, along with the beauty and cultural diversity of Assam, can enjoy the festivals in Assam. Majuli well known as the world’s biggest riverine island is located in Jorhat. Majuli Festival is celebrated in Jorhat during the winter season, presumably in the month of November. Majuli festival is held on the bank of Luit River, which has an excellently beautiful scenic beauty. Many cultural festivals are organized during the festival in Majuli. Many Cultural troupes from Majuli itself and as well as cultural troupes from other parts of the country perform during the festival. Seminars and Exhibitions are also conducted during the festival. The exhibition displays the Assamese products that are specially designed and prepared by the artists that showcase the traditional grandeur of Majuli. Assamese and tribal dishes are also made available during the festival.One can observe the adjustment and gathering of all ethnic groups of people under the same sky, reaching the Majuli Festival of Majuli in Assam. But at the same time the groups also keep on their respective individual and traditional and cultural entities. Majuli Festival is very remarkable event. Lot of opportunities is provided by the Majuli Festival to fit oneself into the festival. Bohag Bihu marks the beginning of the Assamese new year. According to the Assamese calendar year Bohag is the first month and so the name Bohag bihu. The Bihu also marks the beginning of the agricultural season. During this bihu, laaroos, pithas, and other assamese delicacies are prepared and consumed by the people. Many cultural activities are also organized during this Bihu. Kati Bihu or Kongali Bihu is celebrated during the month of October. Since it is during the time when the agriculture and harvest is less, this Bihu is a festival of less merriment and so people in order to pray to Tulsi plant, the paddy fields, granary, and garden light earthen lamps. Bhogali Bihu is the festival of merry making and feast. The bihu is celebrated in the month of January according to the English calendar and in the month of ‘Magh’accordinf to Assamese calendar. People have feast together in this Bihu as because during this time that the harvest is rich. People feast together and they build a cottage like tower with hay which is known as Bhela Ghar in the first night of Bihu which is known as ‘Uruka’. Bhela Ghar is burnt in the morning of Bihu.